"I didn't choose this life. I didn't ask for any of this, but it has been happening for as long as I can remember." Hilary will be among more than 100 people at a national conference this month organised by the Anomalous Mind Management, Abductee, Contactee, Helpline Project (Ammach). She will share her story and compare notes with others who claim to have similar experiences. The first close encounter she recalls came when she was five and playing in the long grass in a field behind her home. She claims an alien broke into a top-secret laboratory at a local Marconi plant while she worked there in the 1974. After abductions Hilary said she suffers migraines and feels very ill. Sometimes she wakes up with fresh scars or bruises. Or there are bloody marks or stains on her clothes or bedsheets. “I’ve got a metal implant in my ear too,” she says. “The doctor said it was wax but I can feel it. My partner Ken has a monitor that detects bugging devices. Hilary will tell the full story of her multiple abductions at the Ammach conference on May 31. "Of course there are sceptics, people who laugh at us, but that doesn't bother me," she said. "Just because they haven't seen it with their own eyes doesn't mean it isn't true. We've had people from right across the spectrum tell us about their experiences, from university graduates to businessmen. They can't all just be stupid." Hilary used to work as draftsman and artist for the MoD and decided to record her encounters by drawing them. One of her pictures shows her as a little girl being dragged towards the spaceship. 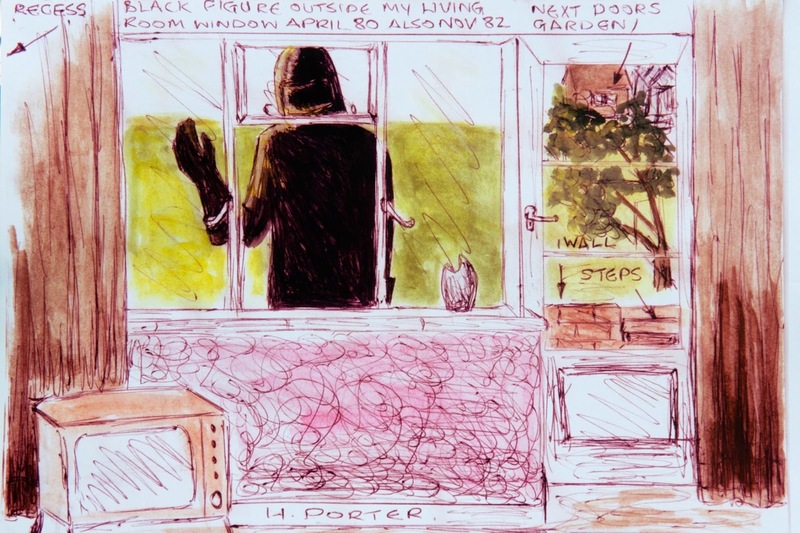 Another sketched in 1980 shows a shadowy figure standing just outside her window. She said: “I had just put my daughter Sally to bed and came downstairs. Then I spotted a huge figure by the window. I froze. "After a few moments he raised his hand and I did the same. "After that I wasn’t quite so frightened. I thought he wasn’t going to hurt me. For years she suffered alone until a “crisis abduction” in 1994 when she says she was shown flashbacks of previous encounters. Pushed to the brink, she started looking for other people with similar stories. That’s when she met partner Ken Parsons, who runs the British Earth and Aerial Mysteries Society (BEAMS). She met more abductees and as someone who can recall many experiences, she began counselling them. “Finding someone else who understood me was so important,” she said. Ken said he believed the aliens were visiting our planet to take genetic material for breeding purposes. "There are greys, the ones everyone recognises, but they are just servants. The reptilians are higher beings, then there is a humanoid type," he said. "But there is something above them, cowled figures. You can’t look at them. Their eyes shine and when they look at you they blast a message into your mind. "They tend to take females more for their eggs and genetic material for breeding purposes. Hilary, of Farnborough, says her abductions have grown less frequent, but strange phenomena still plague the area around her home, which has spectacular views over the Hampshire skyline. She says she’s seen hovering triangular shapes and bright lights flying in formation which she has photographed. She dismisses the idea that it could be military planes from Farnborough airbase, insisting they look and sound different.